In the days leading up to February 14th, it is hard to discount the love in the air as people prepare to celebrate Valentine’s Day. In the USA, Valentine’s Day is a big deal and you couldn’t forget it, even if you tried. To help you celebrate love or even declare love, there are greeting cards, some seriously amazing paraphernalia and an array of gifts that’ll boggle your mind. Candy, flowers, greeting cards, and romantic dinners rule the day around the United States and people also use Valentine’s Day to express gratitude and love for sweethearts, spouses, teachers, parents or just about anyone they feel close to. Romantic private dinners are a great way to bring in this special day. You can plan a cozy cocktail dinner or candlelight dinner away from the crowds and noise. A private setting with music, flowers, candles and a homemade or even catered meal is a great way to shower your love. Just to help you along, we have put together a few impressive savory and dessert Valentine’s appetizers that will make it the perfect Valentine’s Day meal. Our Valentine’s Day desserts and appetizers are designed to make your special day, extra special! Not only are dinner and dance parties organized all over the country to celebrate the occasion to celebrate love, people pull out all stops, in a bid to make it extra special for that special someone - Elaborate meals paired with champagne or sparkling wine. 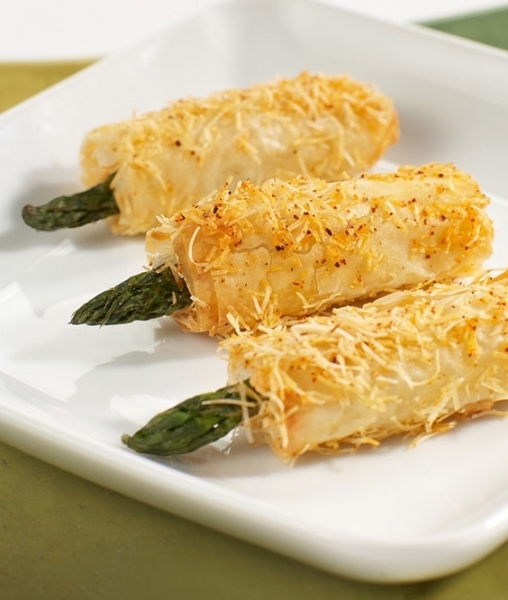 Gently wrapped into a crunchy phyllo roll, paired with the subtle flavors of asiago cheese, and baked, these Asparagus wraps make for the perfect finger food. Quick to dish out, these have the perfect appeal for casual as well as fancy dining! Available at $50.99/tray, there are 50 pieces per tray of deliciousness. 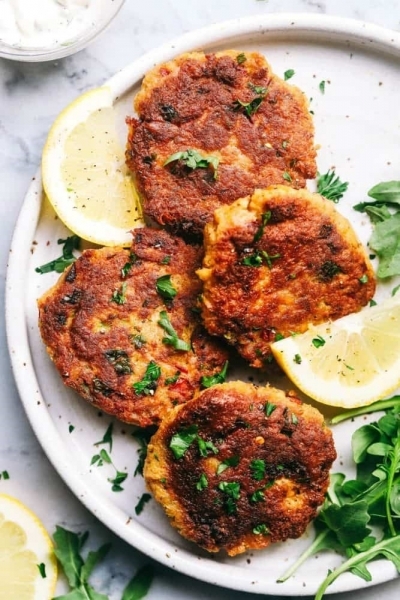 With just the right amount of crunch, these out-of-the-world Crab Cakes are moist on the inside with deliciously seasoned crabmeat, peppers & spices and lightly breaded. Served fried, sautéed or baked, these are priced at $51.99/tray. Each tray serves 40. 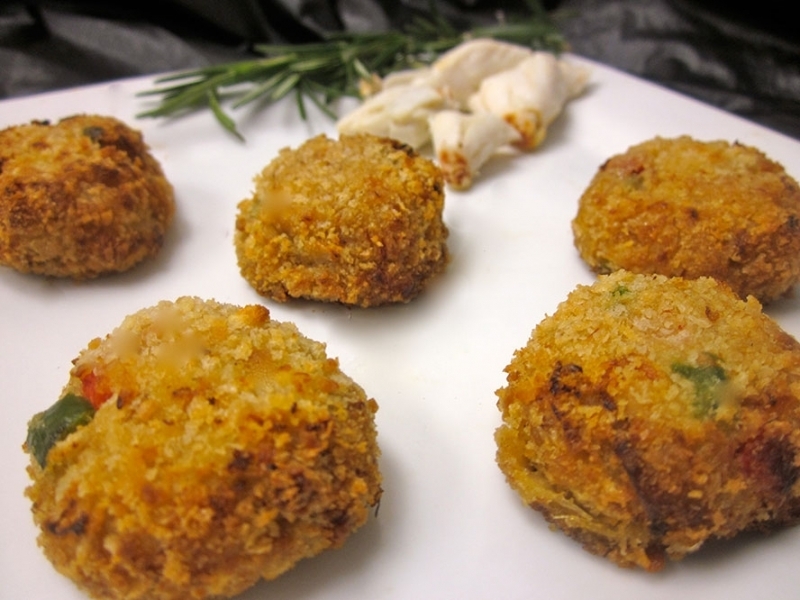 These perfect coconut crumb-topped chicken appetizers require chicken breast to be dipped in coconut batter and then rolled in a mixture of shredded coconut and bread crumbs. 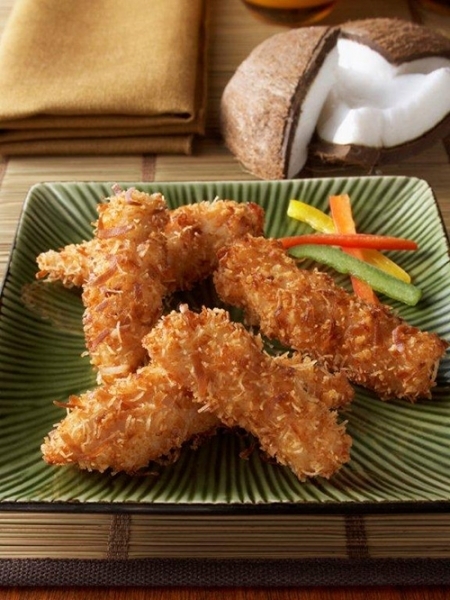 As you bite into it, you can savor the delicate flavors of coconut, with a crispy exterior and the tender meat inside, warming the cockles of your heart. Your Valentine will surely love this! The coconut chicken tender costs $40.99/tray with 35 pieces of love per tray. 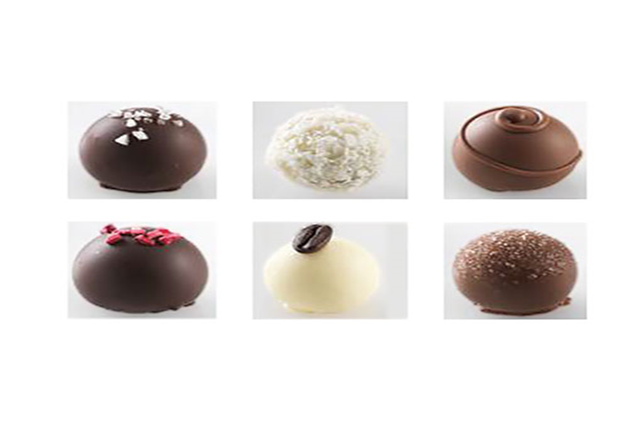 Chocolate truffles are absolute winners and surely the key to a person’s heart! No one will guess you're serving store-bought and with flavors like salted caramel, Bavarian crème, raspberry, coconut, mocha, and champagne, need we say more? This visually arresting and unbelievably decadent treat comes at 35 pieces per tray and costs $39.99/tray of utter sinfulness. Make a real statement with this elegant and exquisite dessert appetizer made from ground almond, sugar and egg whites. 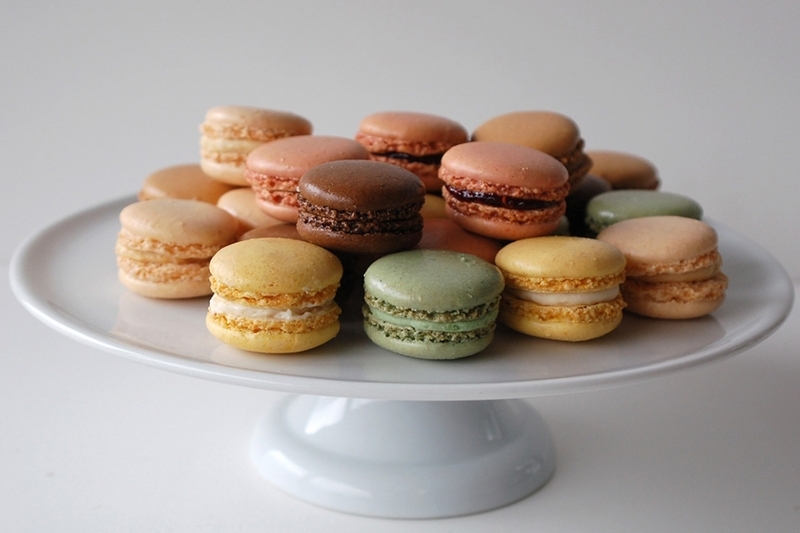 This French Macaron assortment comes in six flavors - raspberry, chocolate, vanilla, pistachio, coffee and lemon and costs $45.99/tray for 48 pieces. 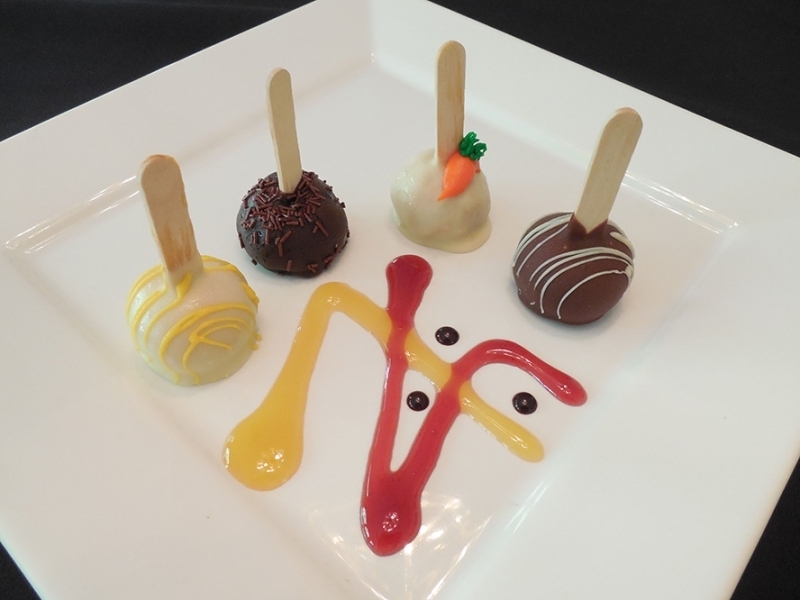 Submerged in a variety of chocolates and decorations, with moist cake flavors like chocolate fudge, carrot, chocolate coffee and lemon, these cake pops are sure to delight your valentine! 45 pieces to a tray at $54.99/tray of utter fun – you just can’t stop at one! So, there you have it! Three delicious savory appetizers and three romantic dessert appetizers for you to impress your valentine with! Ordering from us will take away the stress of coming up with an elaborate meal, now that at least the appetizers are taken care of! Remember, no matter how big or small your party, our appetizers can easily be ordered online. At AppetizersUSA, you will find all of the Valentine’s Day special appetizers talked of above and a host of other ready-made appetizers, available and ready to be delivered at short notice, to help you enjoy stress-free celebrations.